Beijing Oceanarium (or Beijing Aquarium), the world's largest inland aquarium, is located on the north bank of the Chang River within the Beijing Zoo. It covers 120,000 square meters with a construction area of 42,000 square meters and integrates marine animals watching, scientific education and entertainment into a whole body. Beijing Oceanarium is a magnificent architecture shaped like a huge conch shell parking itself on the beach of the Beijing Zoo embraced by green trees and clusters of beautiful flowers. It has the world's advanced life support system that uses artificial salt water totaling as much as 18,000 tons. The seven exhibition halls in the building were designed delicately to encompass seven topics with the purpose of "cultivating the people, educating students, and protecting ecological environment" and they are " Rainforest Adventure" , "Tidal Encounter" , "wonders of coral reefs" , "Shark Wharf" (to be opened in October, 2006), "rare Chinese sturgeon hall" , "whales and globefish gulf" , and "Marine Mammal Pavilion" . Thousands of marine species can be found in the aquarium with tens of thousands of them on exhibition or being raised there. 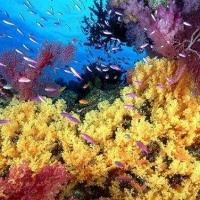 By showing these varied collections of species to visitors and introducing precious endangered animals, as well as presenting excellent marine animals shows and conducting various science education activities, Beijing Aquarium helps to educate the people on the knowledge about aquatic creatures, learn of oceanic tales, and foster their awareness of the conservation and protection of environment. The tourists can be cultivated and benefited from the visiting experience and become more conscious of "love marine animals and protect the earth of our home". 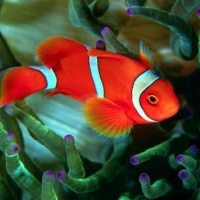 Beijing Aquarium has been ranked among the first batch of China AAAA National Attraction. It was also awarded the Model Group, the highest award in the 11th "Forbidden Cup" held by Beijing Municipal Bureau of Tourism and has been honored consecutively as " Beijing 's civilized Tourist Scenic Spot". Ever since it was opened in March 1999, it has attracted more than 7 million tourists home and abroad and is widely recognized. 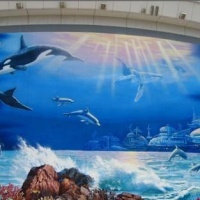 Beijing Aquarium has been granted as the marine popular science education base and the base of popular-science education for juveniles by many governments and institutes and has become a base and publicizing platform of many scientific research institutes for their research on the domestication and artificial reproduction of aquatic creatures. 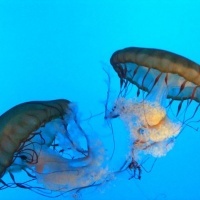 The aquarium is contributing itself to the work of marine science popularization and aquatic creatures' protection and research by resort of its own resources. Beijing Aquarium, a huge aquarium built at the world's level, has become a resplendent pearl of Beijing 's tourism industry and China 's aquarium industry.